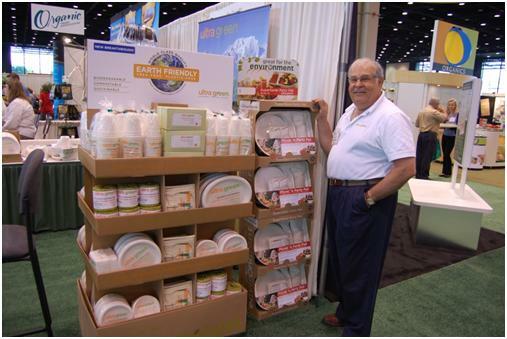 Here is another good marketer at the All Things Organic Show. This one promotes plates and things. You eat the food; the worms will eat the plates and utensils. That is, of course, if you are using Ultra Green utensils that are 100% biodegradable, compostable and sustainable according to Ultra Green CEO Phil Levin. These remarkable paper products will breakdown in a landfill in about 90 days. The cornstarch and seashell-based plastic will be gone in about 150 days. You don’t even have to throw them away. They will breakdown in a regular backyard compost pile with regular kitchen waste. A complete place setting will run you about $1 if you use the Ultra Green Picnic/Party Pack which retails for $11.99 and comes in a package that doubles as a tray for chips and dip. The company, based just outside of Minneapolis, MN markets a complete line of dining and paper products including napkins, paper towels, tissue and toilet paper. All the products use very earth-friendly materials such as cornstarch, sugarcane stalk, and seashells. And, even though regular paper plates and cups will also biodegrade, they consume forests and use harmful chemicals that are not only bad for the environment, but also slow the degrading process. For a Zero-Waste Lunch program these products will work in a pinch. Reusable containers are preferable, but not always the most practical. Composting your place setting is the next best thing to reuse. Our hat is off to Ultra Green products and the company. A great product from a dedicated company.